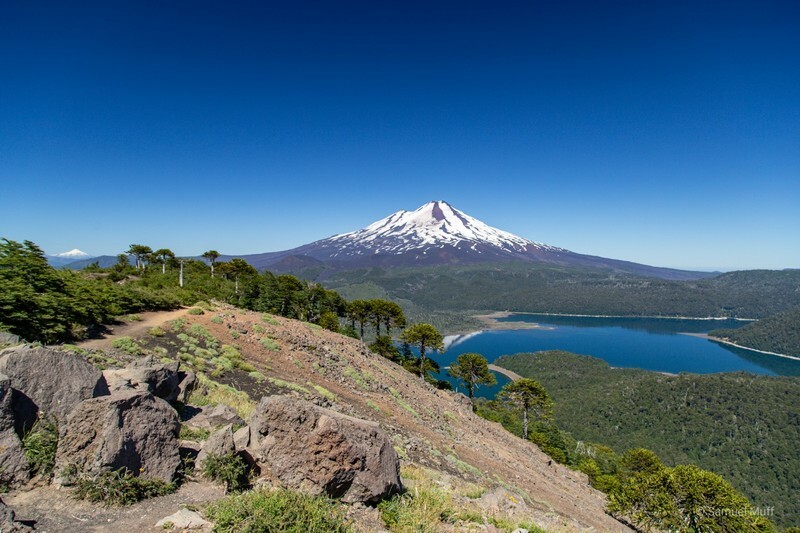 As we left the fertile wine valleys behind on our way south, we entered an area of Chile that is dominated by its volcanoes. We saw more than a dozen of them in just one week. 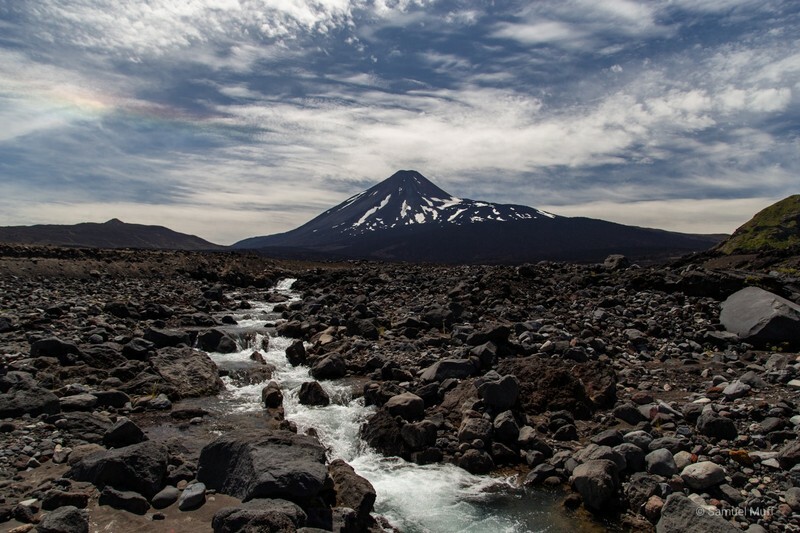 Chile’s volcanoes are extremely active and a few of them had major eruptions within the last decade. 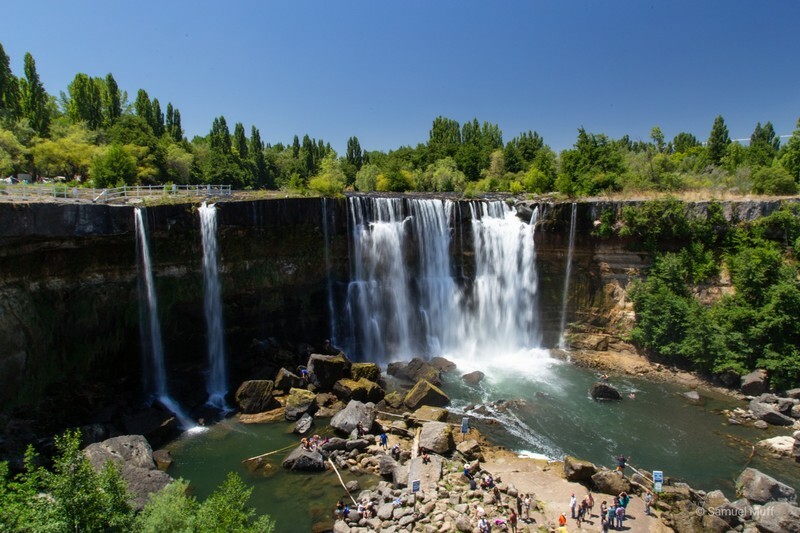 Our first stop was at the waterfalls Salto del Laja. We were a bit surprised with the amount of Chilean tourists that were also visiting the falls. It seems they are a popular family vacation destination. For the night we drove to the Parque Nacional Laguna del Laja, which was blissfully uncrowded. Back in Santiago we had decided to buy a tent for our road trip, in order to be more flexible with accommodations. Here in the national park, we used it for the first time. We stayed at an official campground which was almost empty. For dinner, we wanted to open a bottle of wine we had bought at one of our wine tastings, but we lacked a bottle opener. Fortunately, the elderly inhabitants of a nearby campervan helped us out. 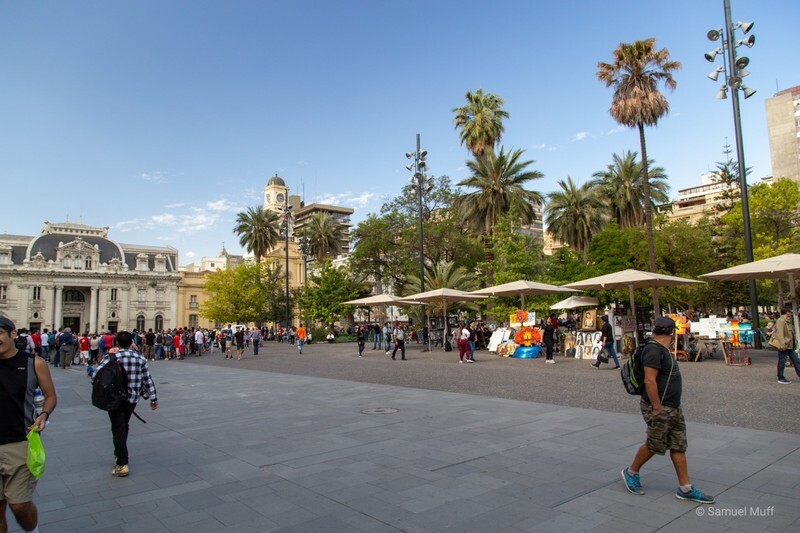 As it was the case surprisingly often in Chile, they turned out to be Swiss (with a Swiss campervan they had shipped from Antwerp, Belgium to Montevideo, Uruguay). 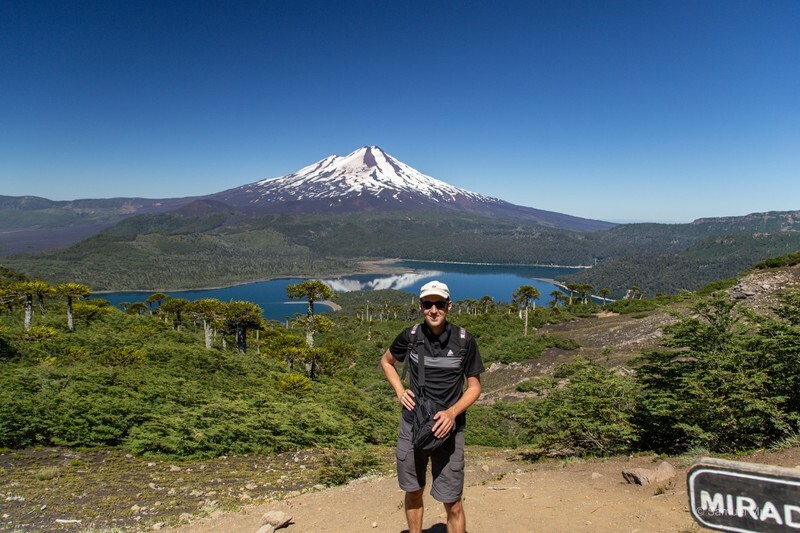 The next day we did a short hike in the park with great views of a hanging glacier and the dark and imposing Volcán Antuco (2979m). Later that day we crossed into the region known as Sur Chico. 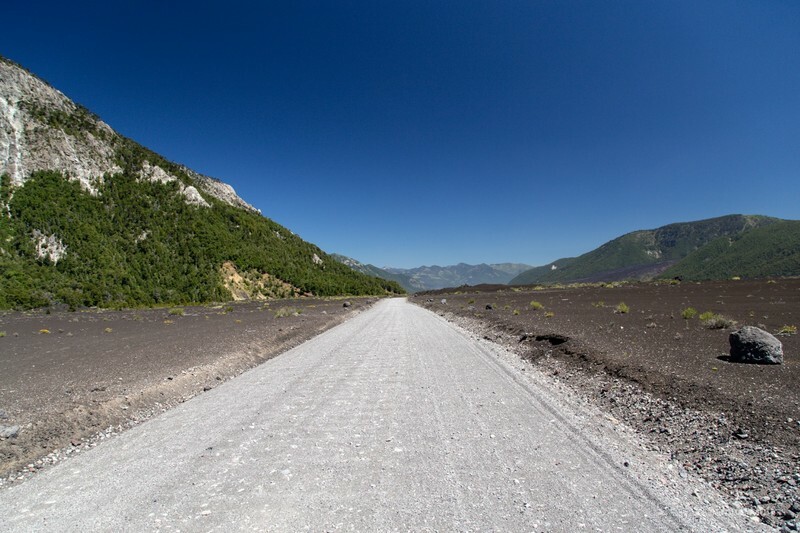 The drive offered spectacular views of three snow-capped volcanoes. We spent the night at a lodge owned by Swiss people, which Sam chose primarily because of the promise of Fondue and Raclette on the menu. Disappointingly, à la carte dinner was not available that day and we had to settle for a set menu which had nothing Swiss about it. 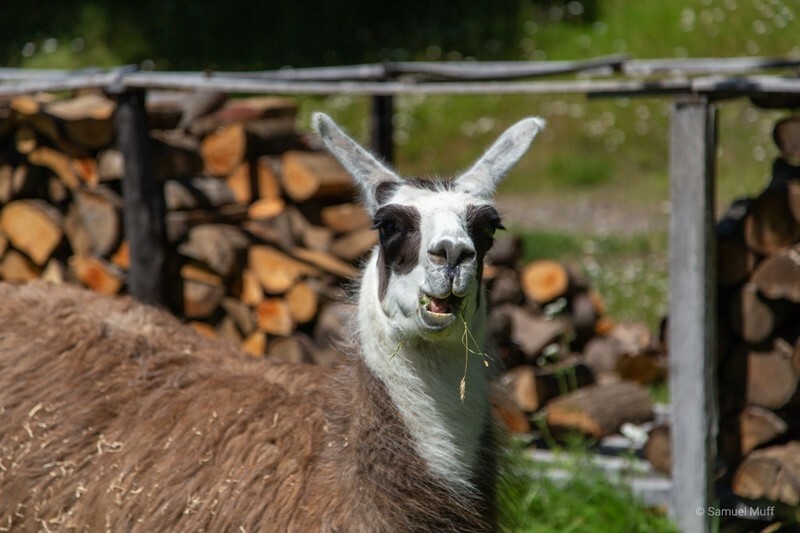 On the upside, the lodge had some very cute lamas in the backyard. South of the lodge was Parque Nacional Conguillío, which was only accessible by a difficult dirt road that made us fear for our little rental car. Still, we made it into the park and with some difficulty, we managed to secure a campsite for the night. Given the condition of the road, we had assumed that only few people would go to the park but we were wrong. The park and the campings were quite crowded with mostly Chilean vacationers. 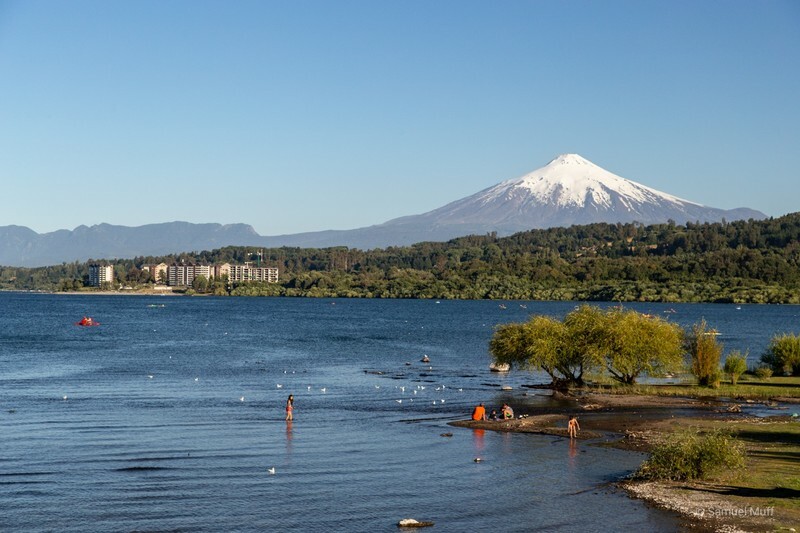 We enjoyed the beautiful mountain views from Lago Conguillío in the evening, but the giant Volcán Llaima (3125m) at whose foot we were standing could not be seen from there. To get this view, we had to do a hike the next morning. The path led through a beautiful forest of Araucaria trees, which look a bit like trees with cacti on top. 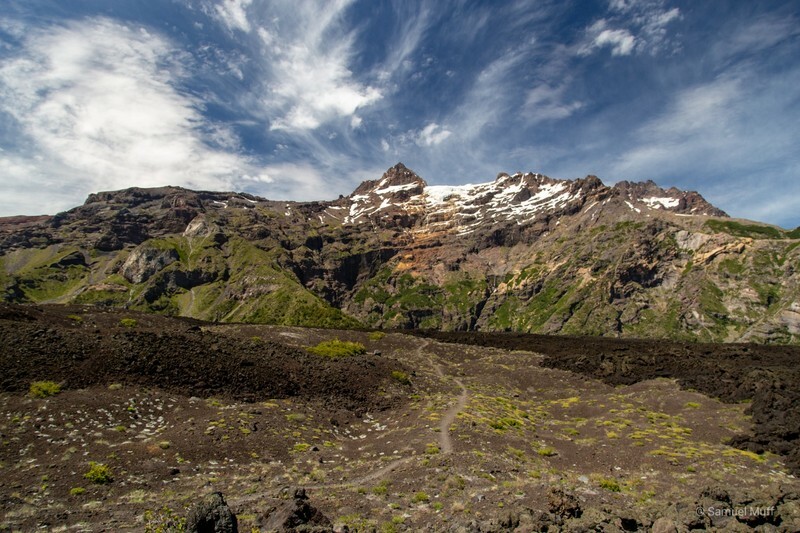 At the final lookout, high over the lake, the volcano could be seen in all its glory. The next two nights we spent in Villarrica, from where there are amazing views of the town’s namesake volcano, Volcán Villarrica (2861m). 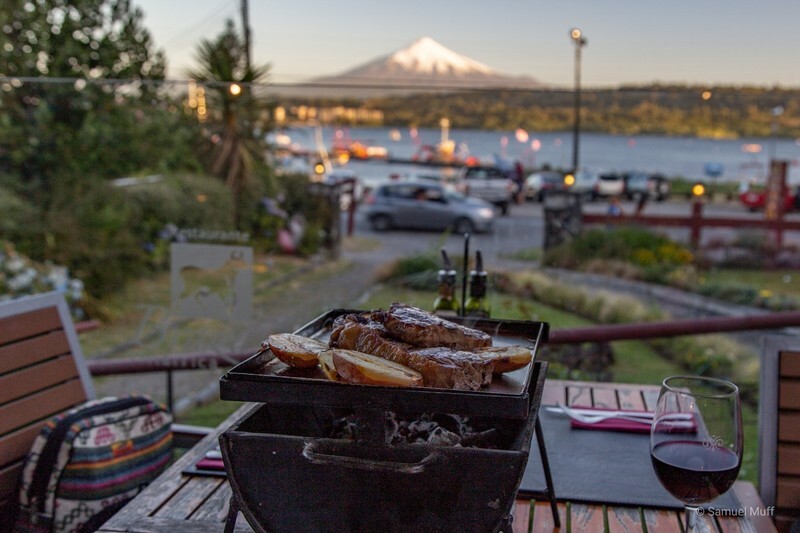 We treated ourselves to a great Asado dinner with perfect volcano views. Asado is a traditional Chilean barbecue. We were served three different cuts of beef, still on the sizzling grill. 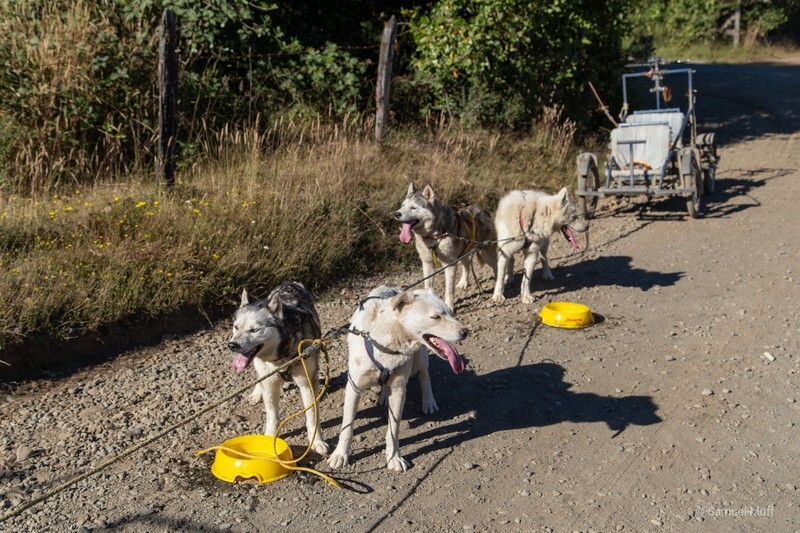 Our favorite experience in Sur Chico was the visit to a husky farm south of Villarrica. 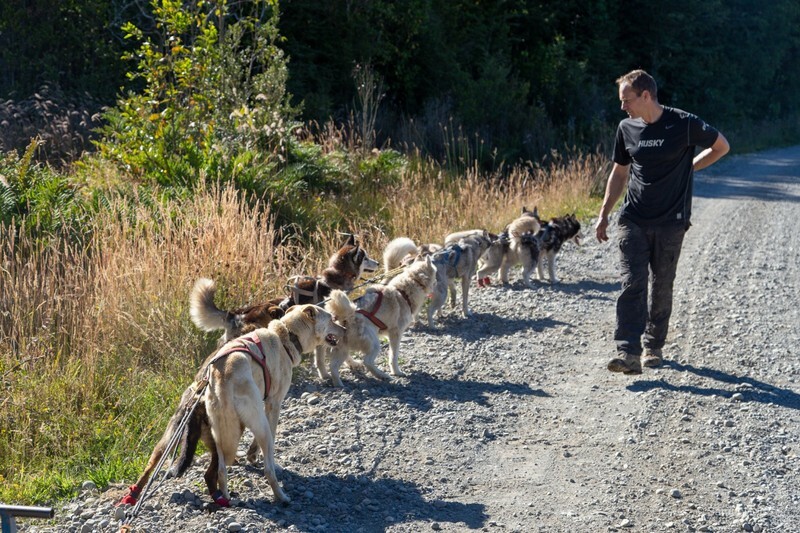 A German ex-air force instructor founded this place and was by now owning 57 competitive sled dogs. In the summertime he trains his huskies by letting them pull a wheeled cart with tourists as payload, in this case the two of us. It was fascinating to learn about these animals. Through hundreds of years of selective breeding, these dogs now have a stronger will to run than to survive. It was absolute madness when we were starting to take out the dogs to go for the run, as every dog barked and ran around to show how much he wanted to be chosen. As Konrad, the owner, explained, if he did not tell the dogs to stop at some point, they would run until they die of exhaustion. During the run, he controlled the dogs solely with his words, telling them to slow down, speed up or to turn. They were extremely well trained and followed every command. 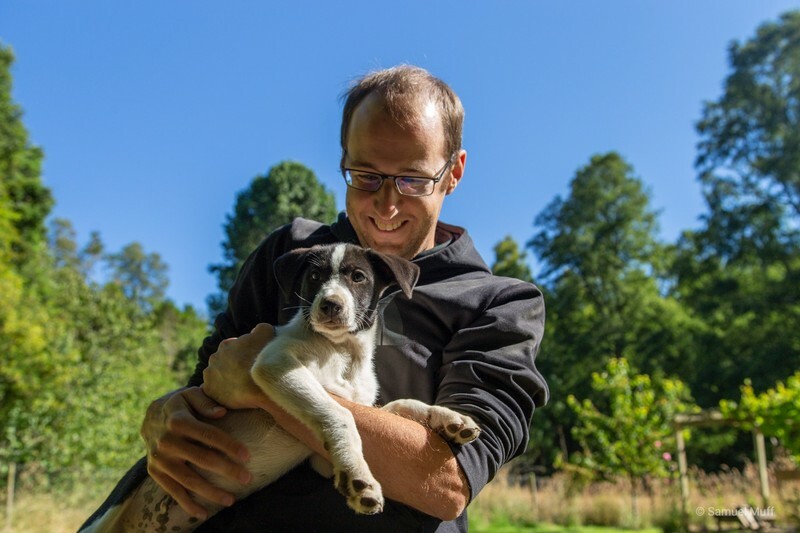 After the training was over, we could play with the incredibly cute puppies. Along the way south on the Pan-American highway, we stopped for one night at a beautiful remote lodge run by an eccentric Frenchman. 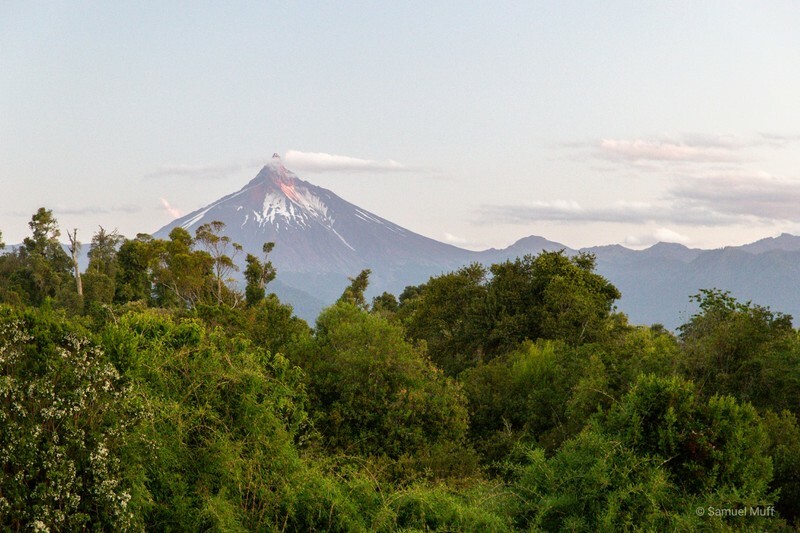 There were great views of Volcán Osorno (2652m) and Volcán Puntiagudo (2498m) from the lodge. 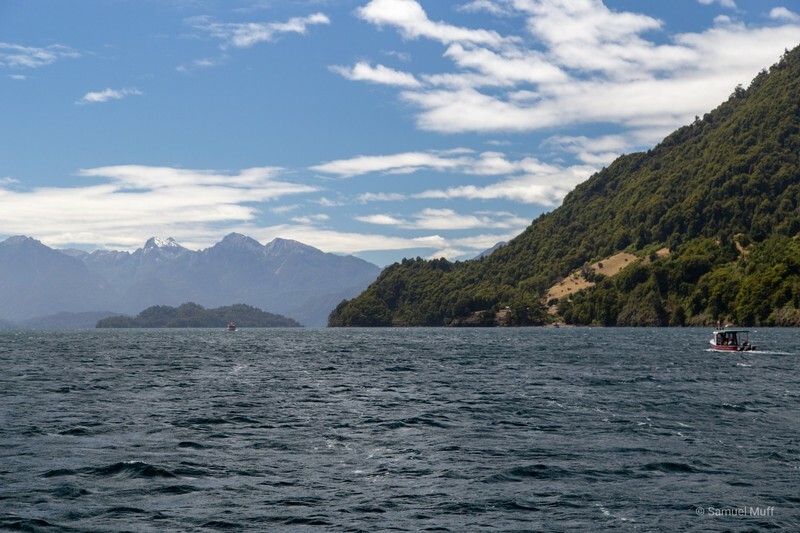 Many places towards the South of Chile have strong influences from European immigrants. Especially Germans have left their mark on the region, which is why great local craft beers can be found everywhere. 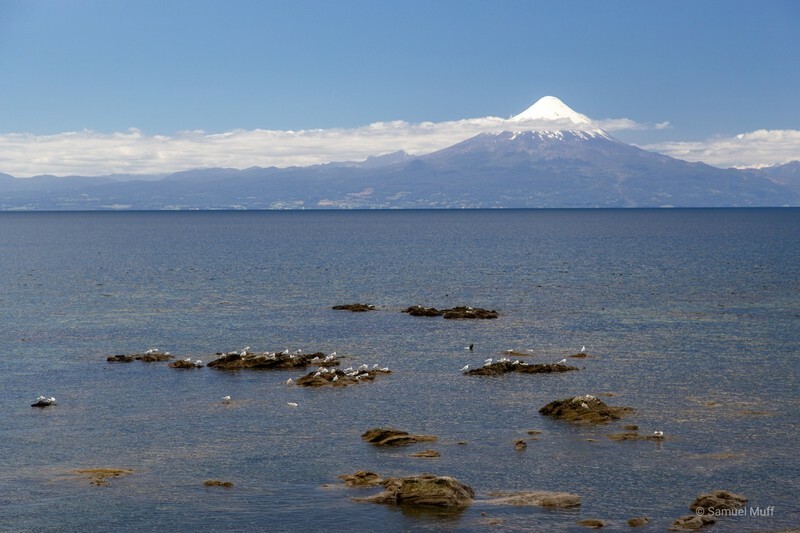 The last two nights in the Sur Chico region we spent in Puerto Varas, which is located at a beautiful lake, of course with views of several volcanoes. 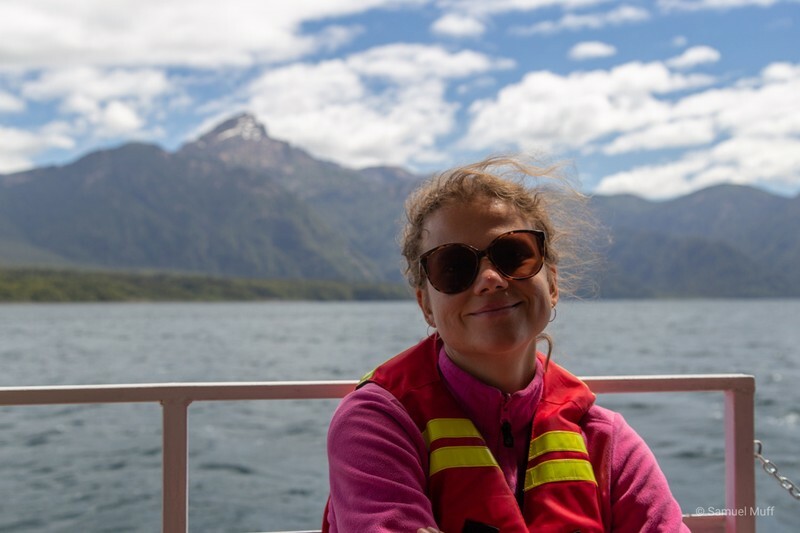 From there, we also explored Lago Todos Los Santos, a lake surrounded by mountains and forests untouched by human developments. After Valparaíso, we decided to rent a car for two months. 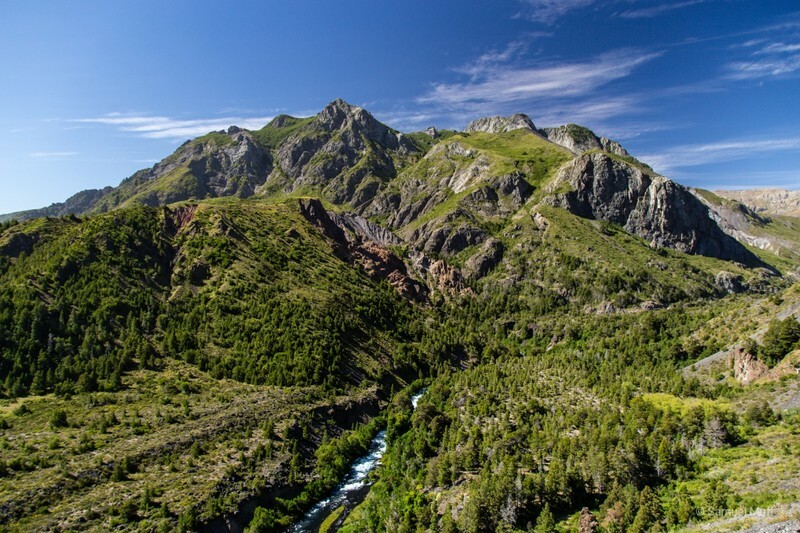 The plan was to drive south on the Chilean side of the Andes as far as possible and return up again on the Argentinean side. Ideally, we’ll make it all the way to Tierra del Fuego. 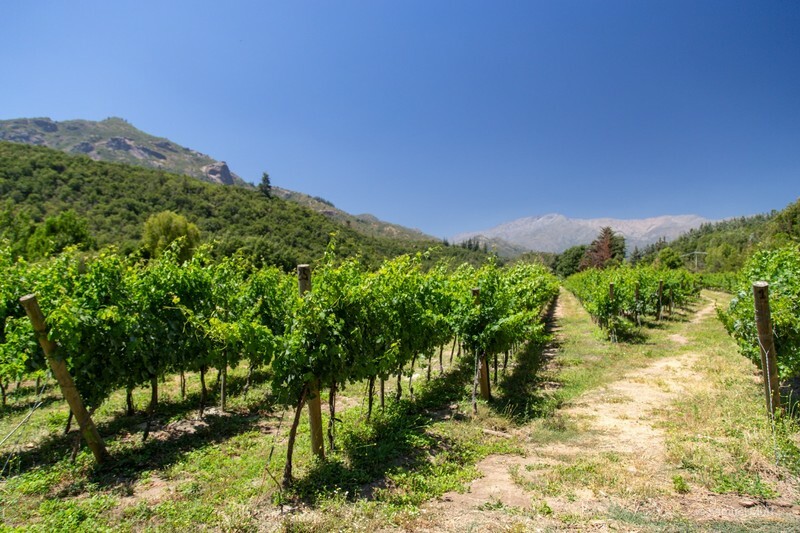 Our first stop on the way south from Santiago was the main wine producing region of Chile. We already came to like Chilean wine in the short time we’ve been in the country. 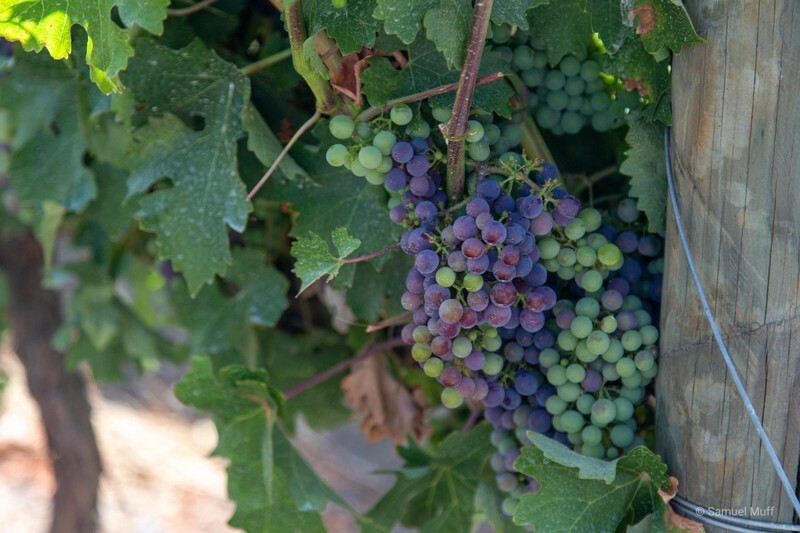 The signature grape of Chile is Carménère. 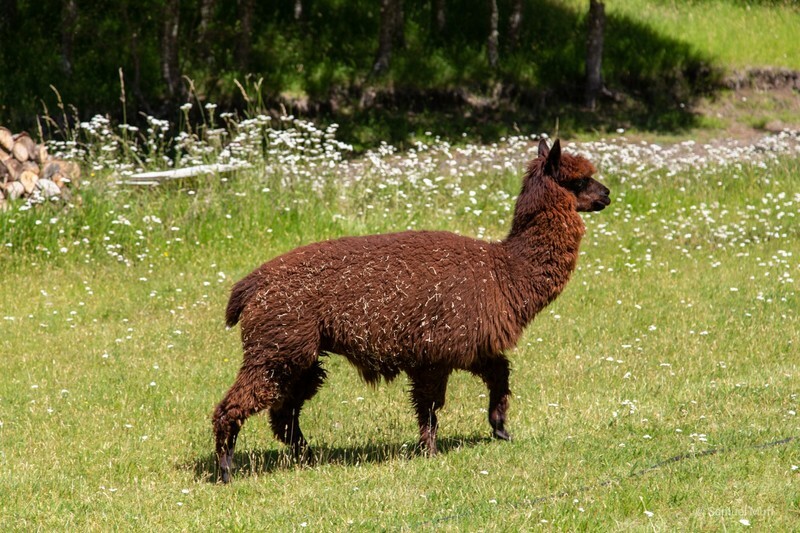 This variety is originally from Europe, but somehow became extinct there. The wines from Carménère are usually quite light and very easy to drink. The best thing about wine in Chile is that you can buy really good bottles for less than 5 dollars in a supermarket. 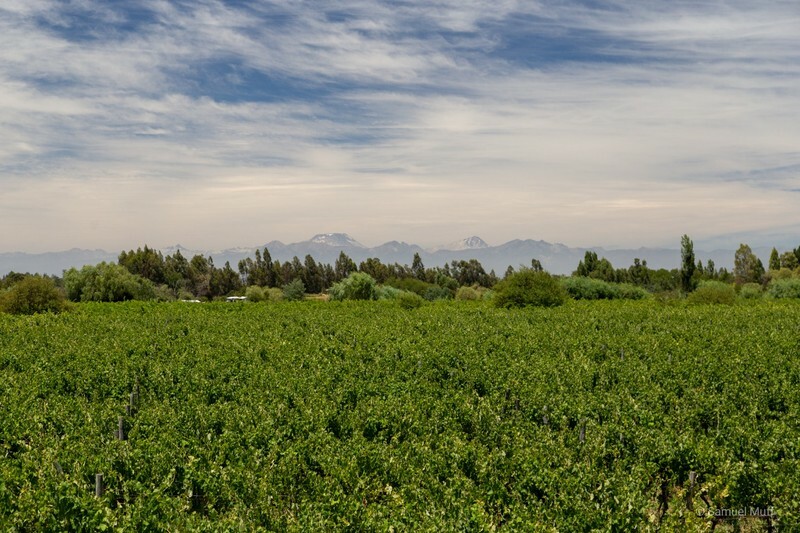 Our first stop south of Santiago was in the Colchagua valley. 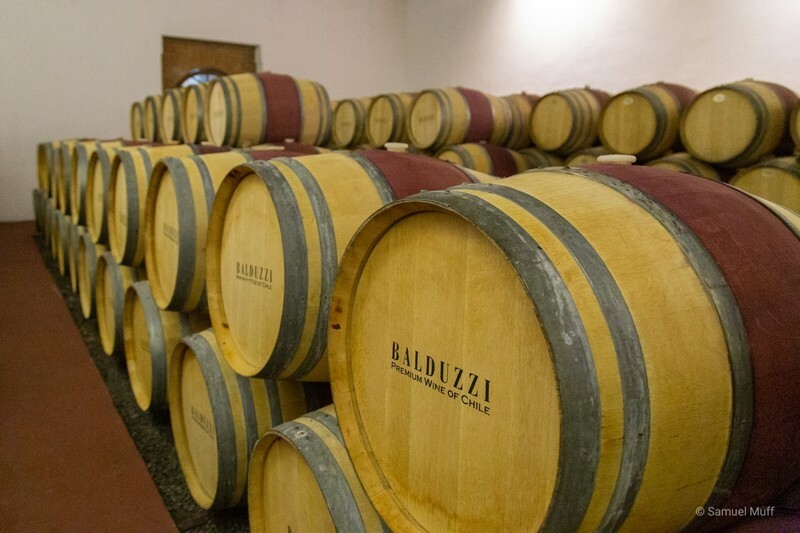 We stayed for one night at a boutique vineyard surrounded by a beautiful mountain scenery. We had a fantastic Cabernet with dinner there and learned that the best wines are never sold in Chile, but exported, for example, to Europe, where they can make a lot more money. 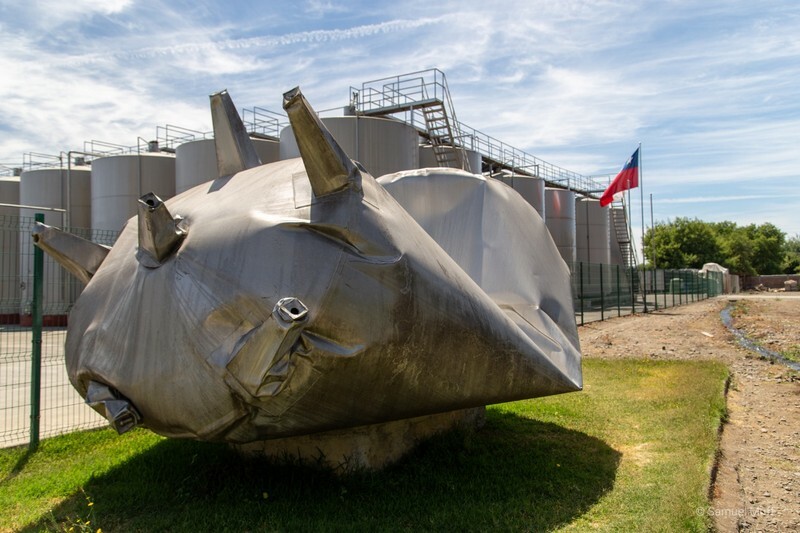 Next we spent two nights in Talca in the Maule valley, where a lot of Chilean wines sold abroad are coming from. Many wineries in Chile offer wine tastings or tours of their vineyards, but in most cases a car is needed to reach these places. 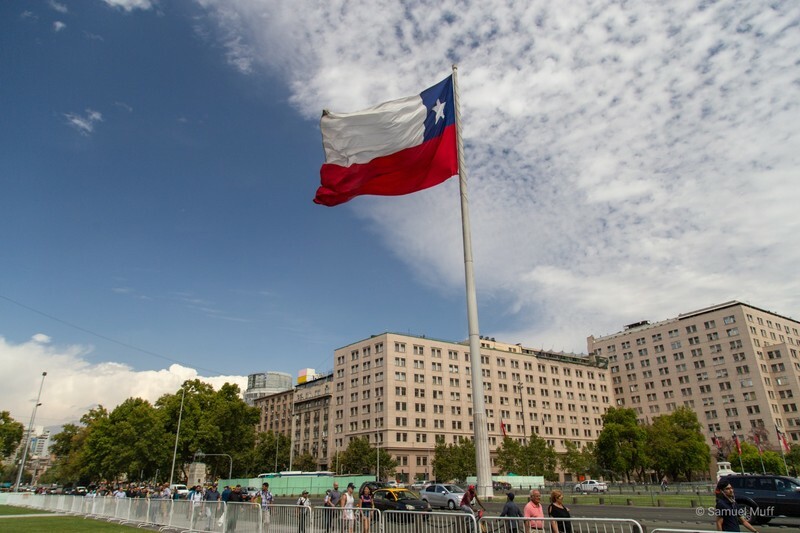 This creates a bit of a dilemma, as there is a zero-tolerance policy for drinking and driving in Chile. Even after a small glass of wine, it would be illegal to sit behind the wheel of a car. With a combination of public buses and Uber, we managed to visit two wineries and drink there as well. The portions at the wine tastings were very generous. At the second vineyard, our friendly tour guide kept pouring us more and more wine while we were talking and we ended up a bit tipsy. In the end, we bought four bottles of wine that day which we enjoyed over the next days of our road trip. 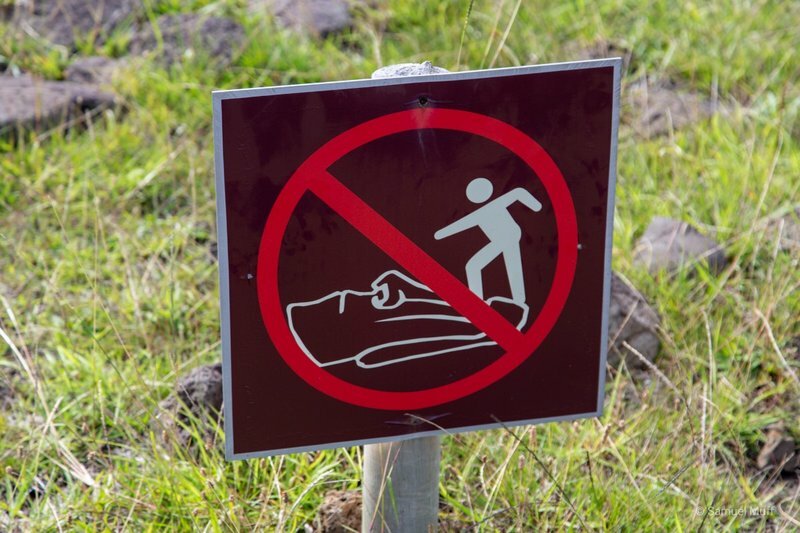 Our five days in Easter Island have taught us that our Spanish was not good enough. Google Translate is a great tool, that allowed us to ask whatever questions we had. It just didn’t help much in the end, since we often had no clue what the person we were talking to replied. 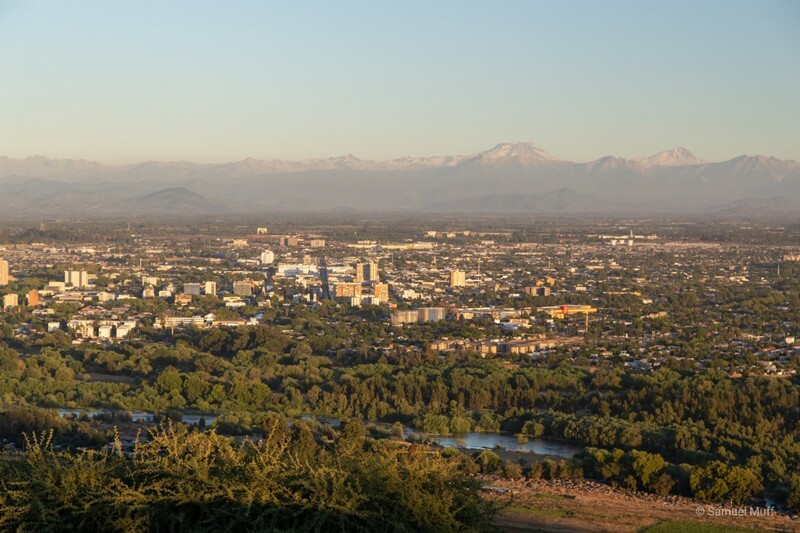 So when we arrived in Santiago de Chile, we decided to invest a few days to improve our Spanish. We signed up for a three day intensive Spanish course where we would spend six hours a day studying Spanish. The Spanish school turned out to be a great idea. Not only did our Spanish improve faster than we expected, but we also really enjoyed our time in the classroom. The class was fast paced, but covered all the grammatical basics. We learned to conjugate verbs, use past and future tense, build passive sentences and much more. Marta previously used the Babel app, which basically lets you learn entire sentences. We found the class much more useful, because knowing the grammar behind allows you to adapt any given sentence to countless different situations. After the 3 days, our Spanish was still basic, but we could now comfortably order food in a restaurant, ask about available rooms at a hotel or talk about our travel plans with our Uber driver. 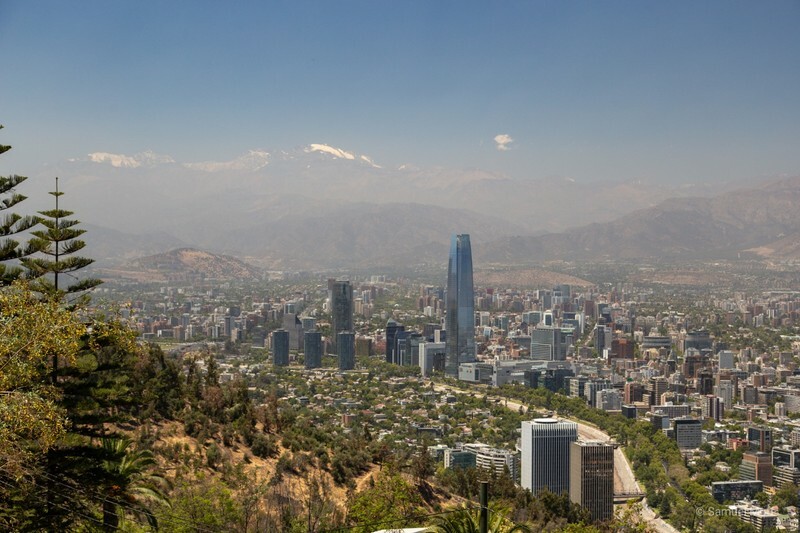 Santiago, the capital of Chile, is a perfectly nice city, but somehow fails to stand out in any way. 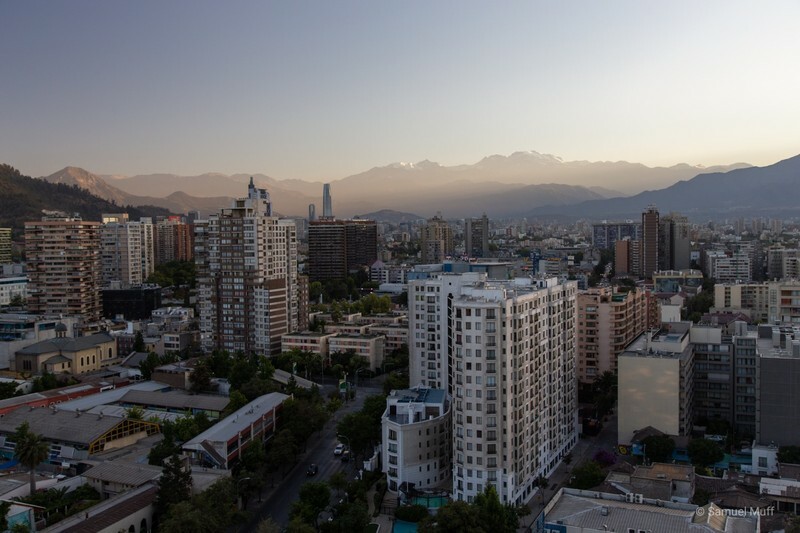 We stayed near the old center of the town, in an apartment on a high floor, which had wonderful views over the city with the Andes in the background. On our school-free days, we explored the main sights of the city. 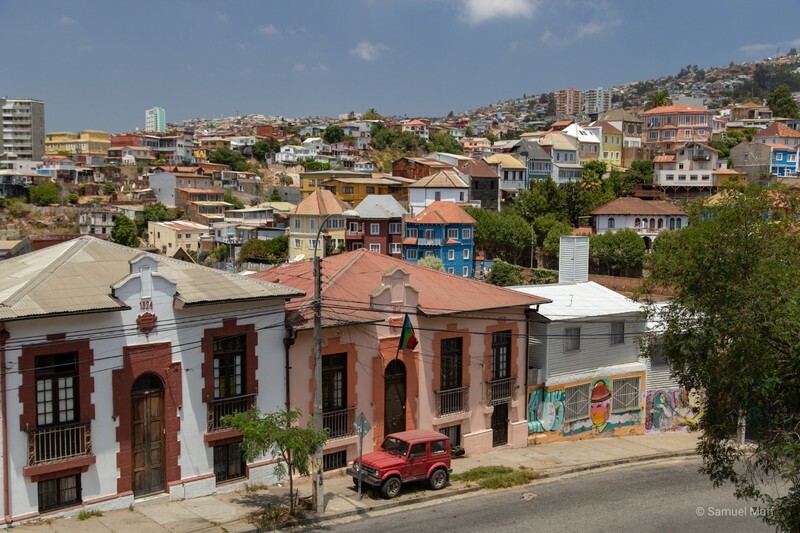 One of our favourite places was Cerro San Cristóbal, a hill to the north of the city center with even better views than from our apartment. We also visited a former detention center, where dissidents were tortured and in some cases killed during the regime of Pinochet, Chile’s infamous military dictator of the 70s and 80s. 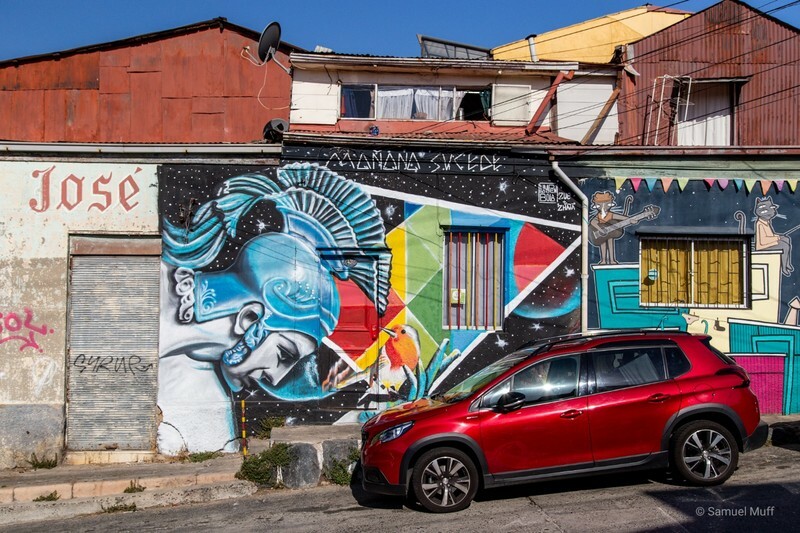 After five days in Santiago, we rented a car and drove out to the coast, where we stayed two days in Valparaíso. The port city is built into a very hilly coast, which makes getting around in it an interesting challenge. Throughout the city, tiny funiculars (ascensors) run up and down the hills, most of them from the early 1900s and very much looking that way. Together with the colorful houses, we experienced it as a very charming place. 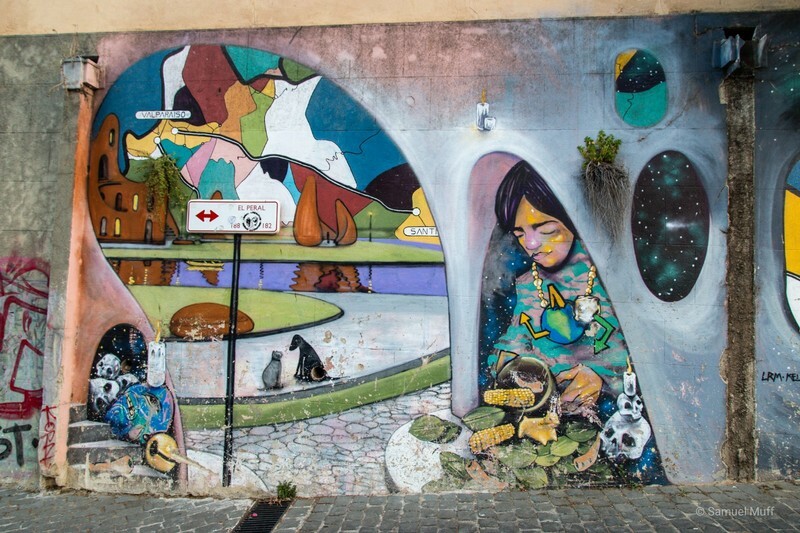 Valparaíso is also full of interesting art. 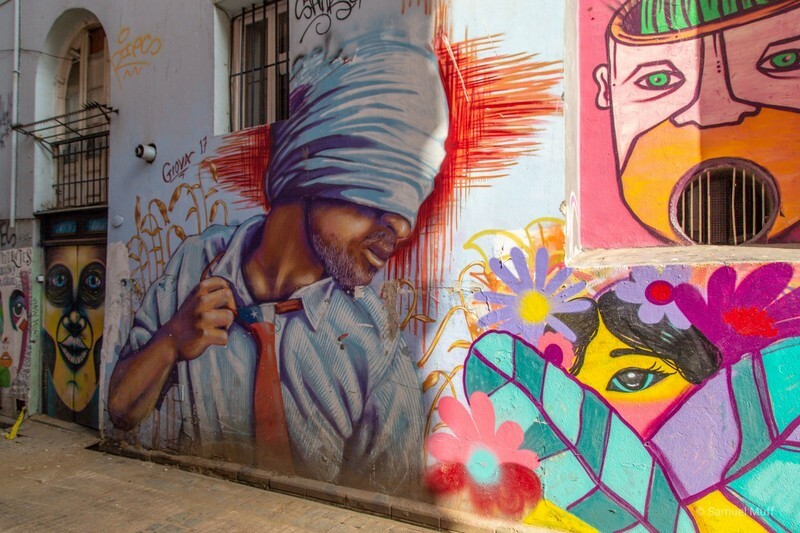 In every little side street you can find beautiful and interesting murals. Some are small, while others cover entire high-rises. 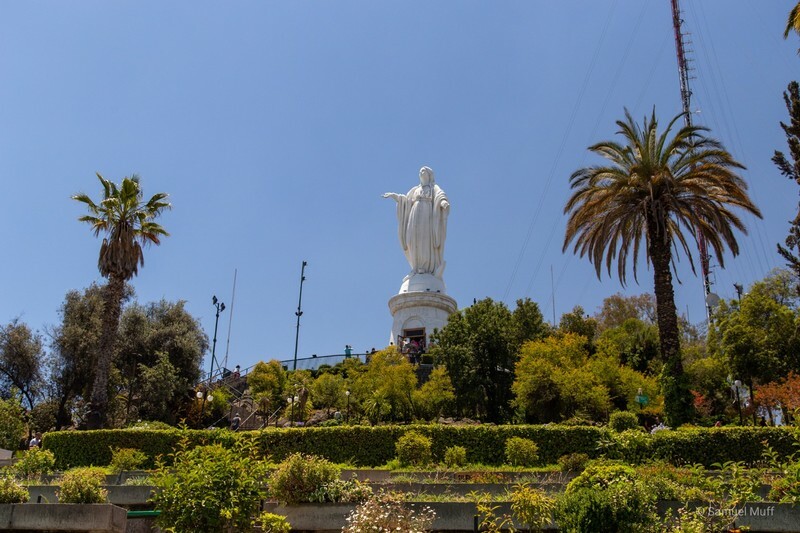 We also spent one day in Viña del Mar, which is just north of Valparaíso. 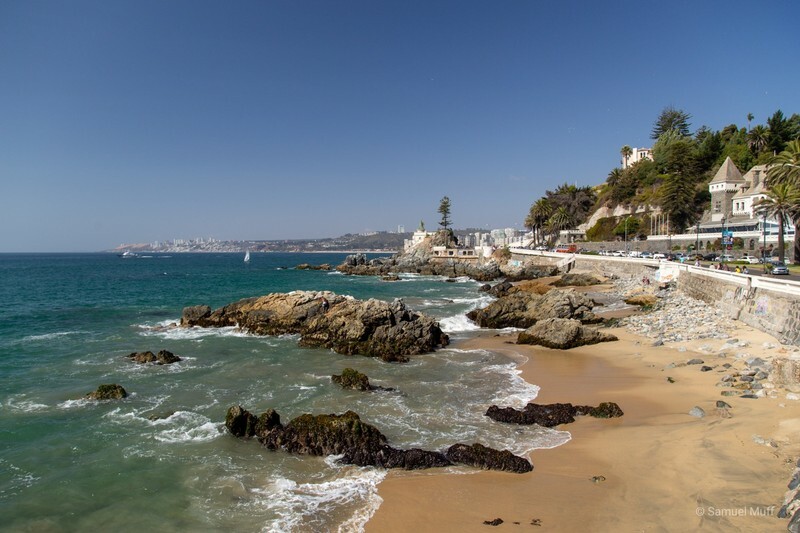 Viña del Mar has a beautiful coastal area, which is probably why the president of Chile has his summer residence here. 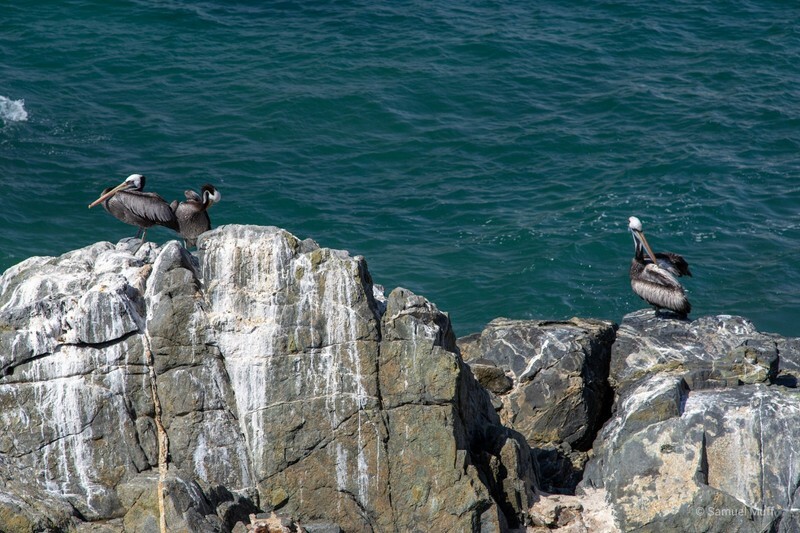 We loved watching the huge pelicans fly alongside the coast. 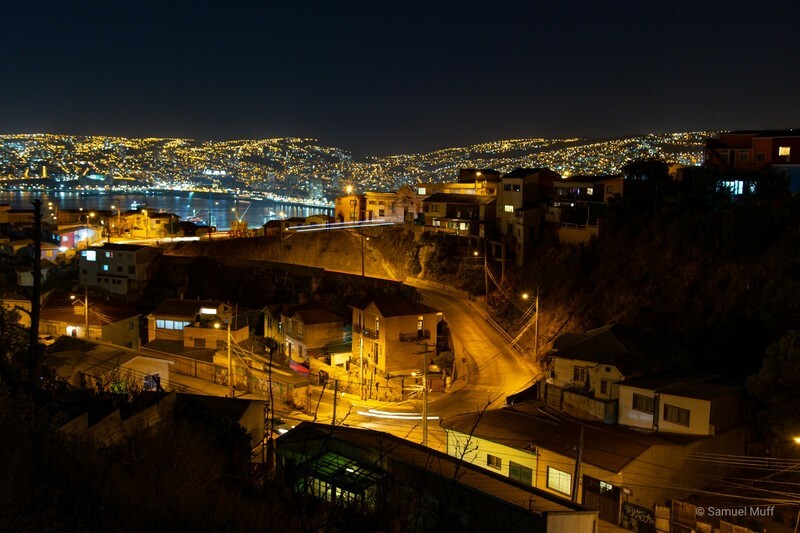 On our last evening in Valparaíso, we were surprised by an earthquake while getting ready for bed. Our room was shaking quite a lot for a good minute, but luckily it was not strong enough to cause any problems. As we learned shortly after, this earthquake had a magnitude of 6.7. Luckily, the epicenter was around 400 kilometers to our north. It was an interesting experience, as we have never been in such a significant earthquake, but we still hope we will not experience it again. 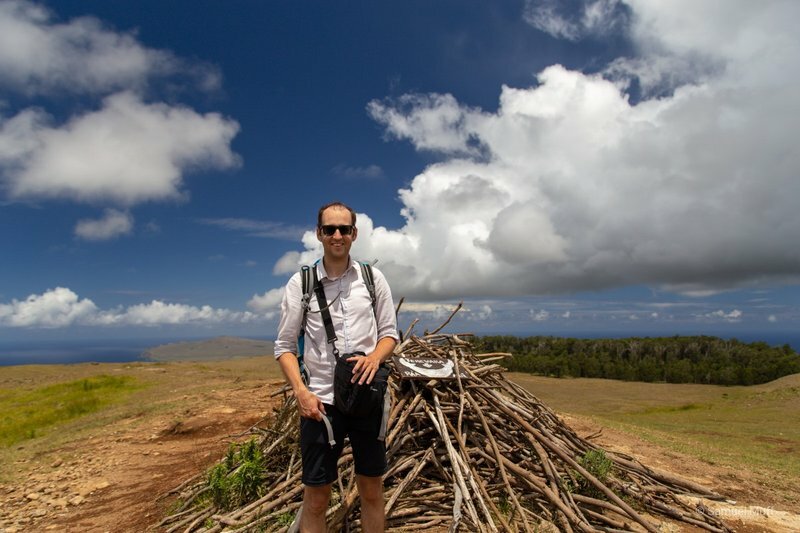 After a 5 hour flight from Tahiti we arrived to Easter Island, our last stop in the Pacific. 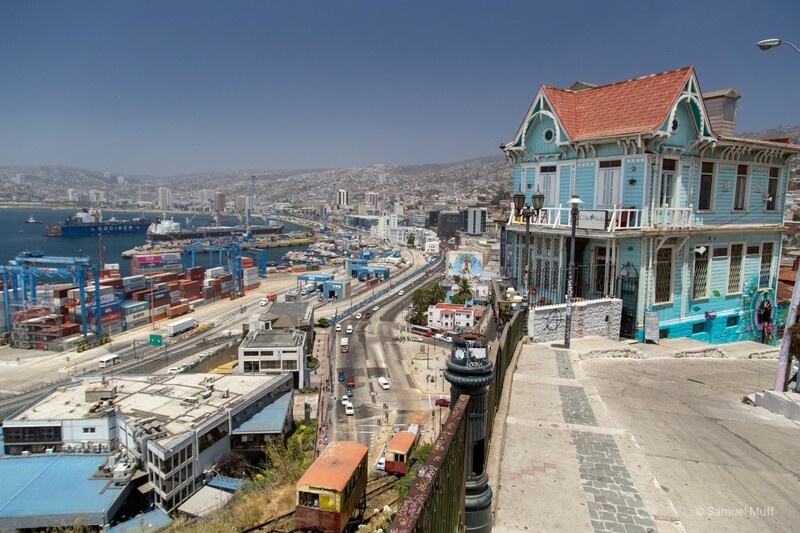 Politically, the island already belongs to South America, as it was annexed by Chile in 1888. 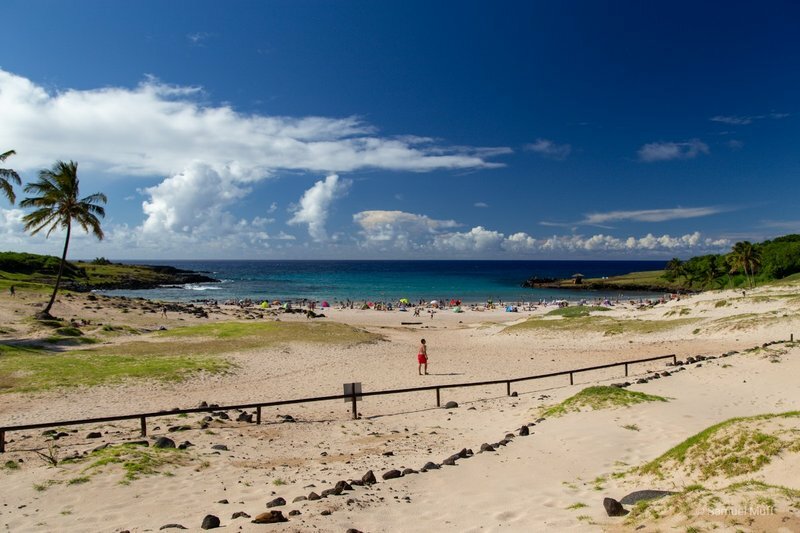 But culturally, Rapa Nui, how the native inhabitants call it, is definitely a part of Polynesia. 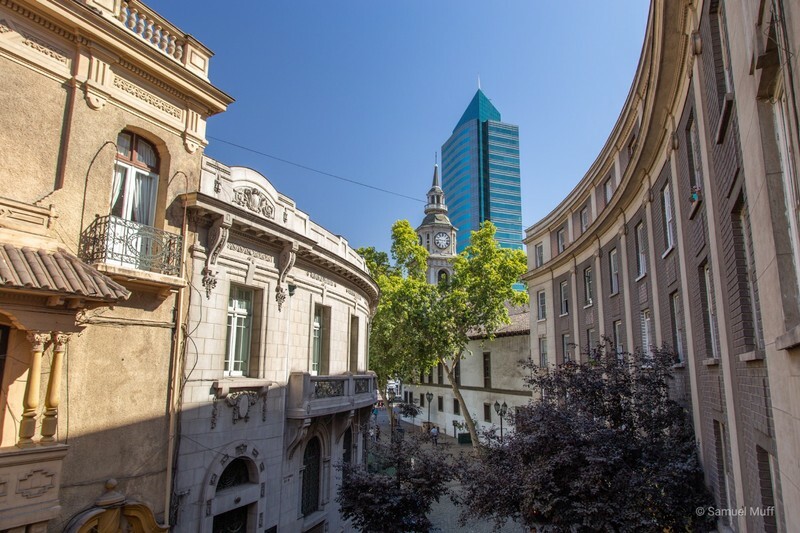 One thing that we came to like about our long trip is that it lets us see cultural and historical connections between different countries that would go unnoticed when visiting these places years apart. 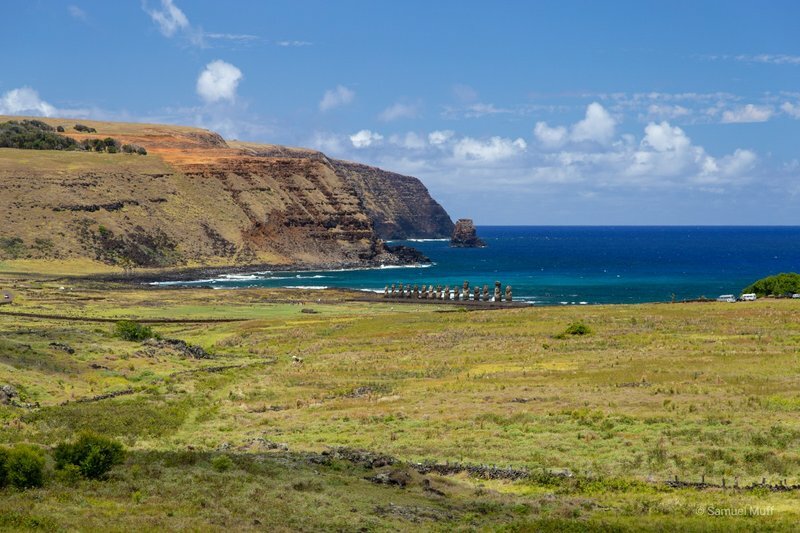 It was fascinating to see how the incredibly far away islands of Hawaii, Tahiti and Rapa Nui share a very similar language and similar cultural elements, like the ritual of giving Leis (flower necklaces). A testimony to the fact these islands were settled by the same peoples, who have then retained the same culture for hundreds of years. 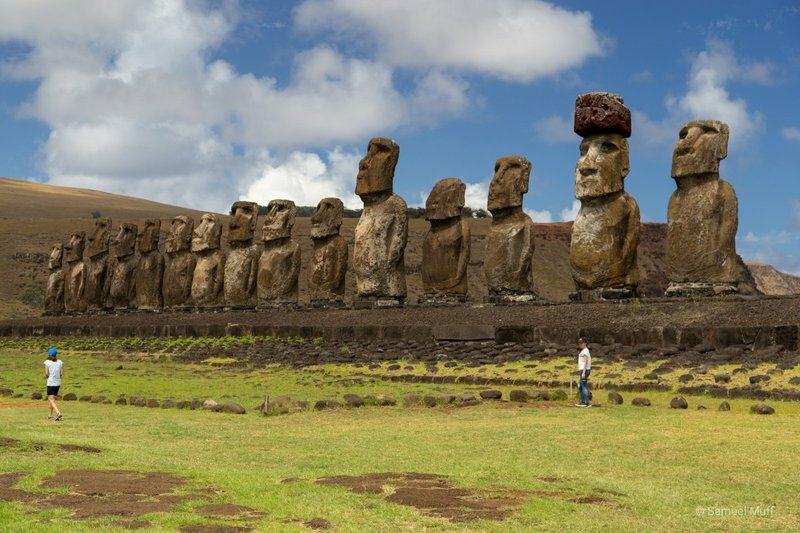 We enjoyed the first evening on the island with a Pisco Sour, but there is, of course, exactly one reason why we and most everyone else decided to stop in Easter Island: Moai. 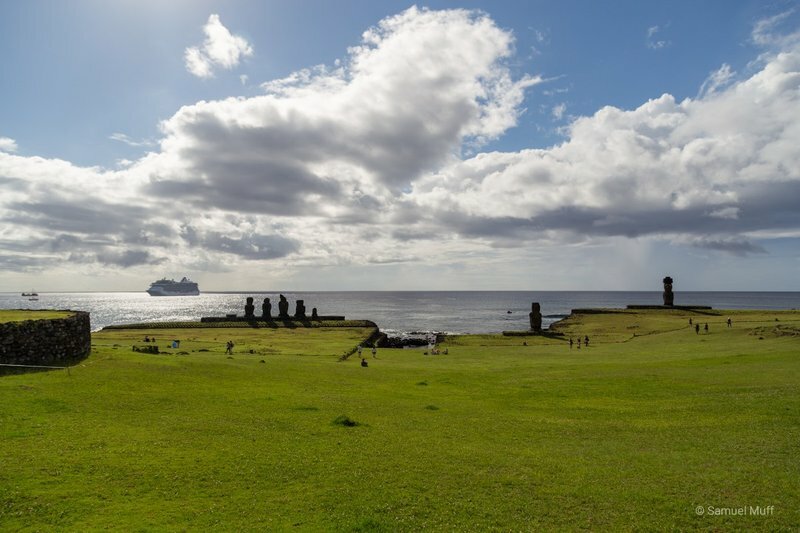 We spent 5 days exploring the different locations where one could see Moai. The anthropomorphic statues were created as images of the inhabitant’s ancestors. 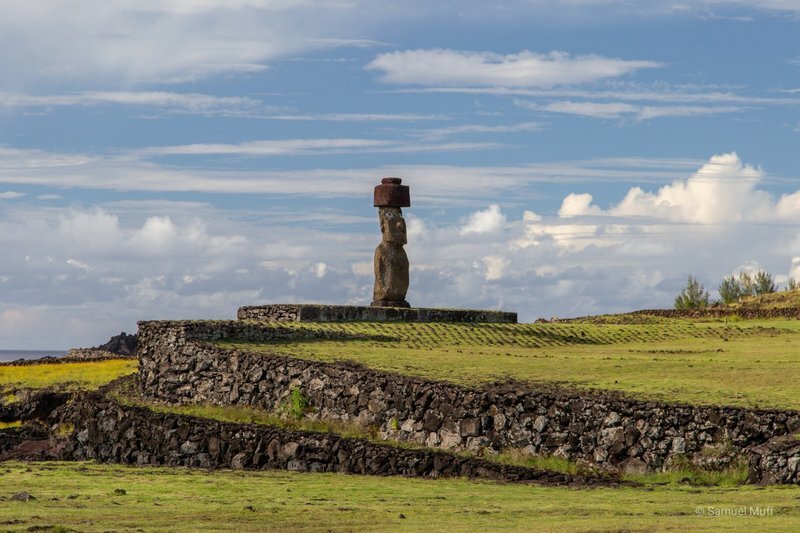 The Easter Islanders worshipped their ancestors and hoped they would protect their island from the dangers of the ocean, which is why almost all Moai are facing towards the inside of the island and away from the sea. 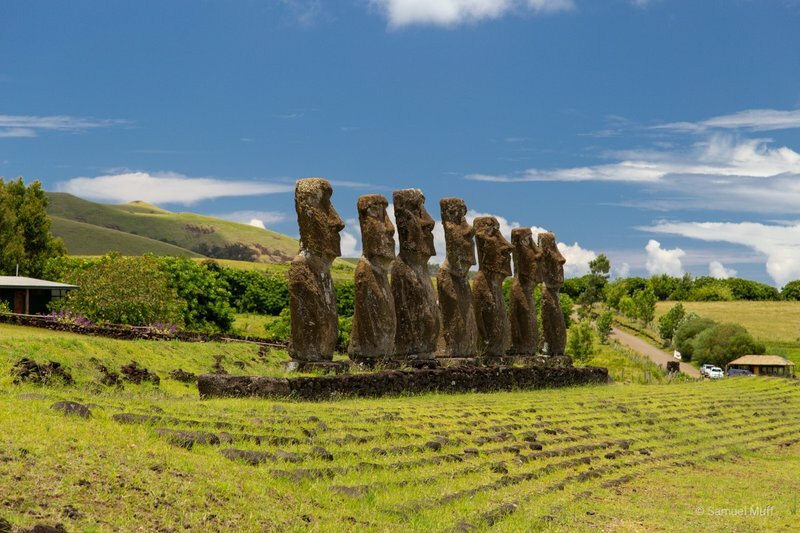 There is only one group of Moai, called the Seven Explorers, that is looking towards the ocean, as they were meant to traverse the Pacific Ocean in search of other civilizations. 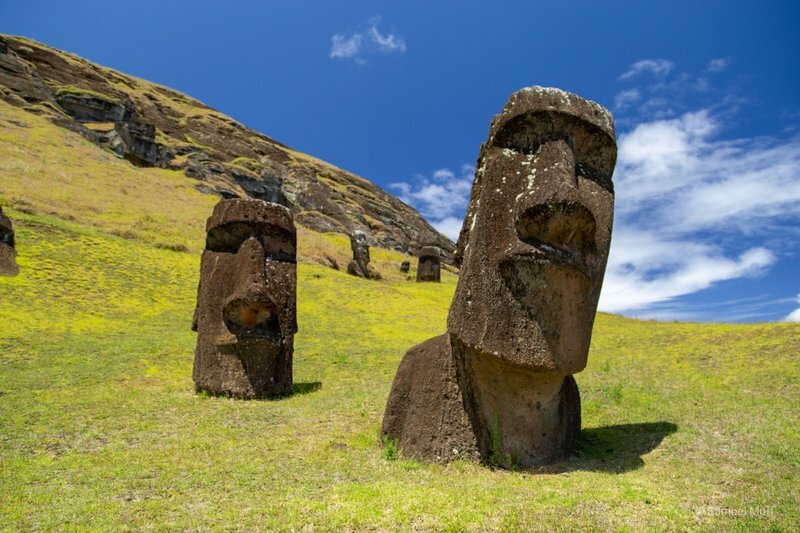 The statues were carved out of volcanically hardened rock and they are from 3 to 10 meters tall. 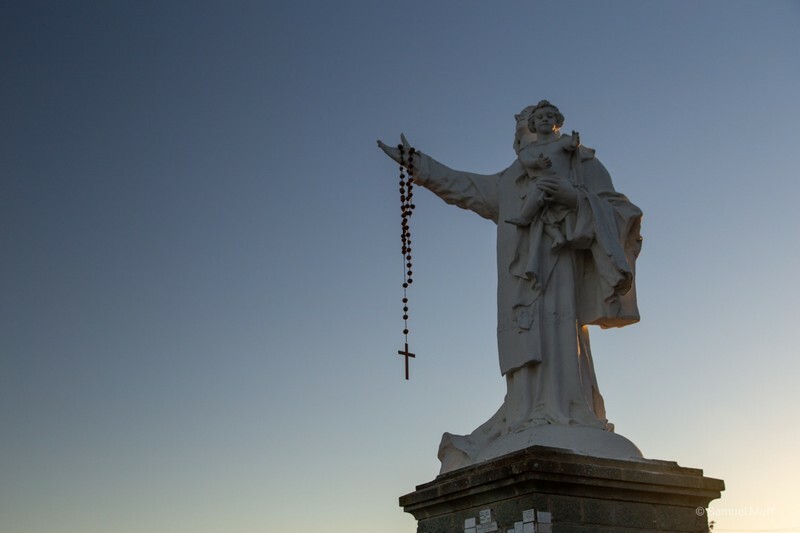 Some of them weight as much as 10 tones and until today, nobody knows exactly how these statues were transported from the place of their production to the various locations around the island. Some hypothesize that they were rolled on tree trunks, while others speculate some form of sledges was used to move the heavy load. It was truly fascinating to see these huge statues standing around, something that can be seen nowhere else on the planet. 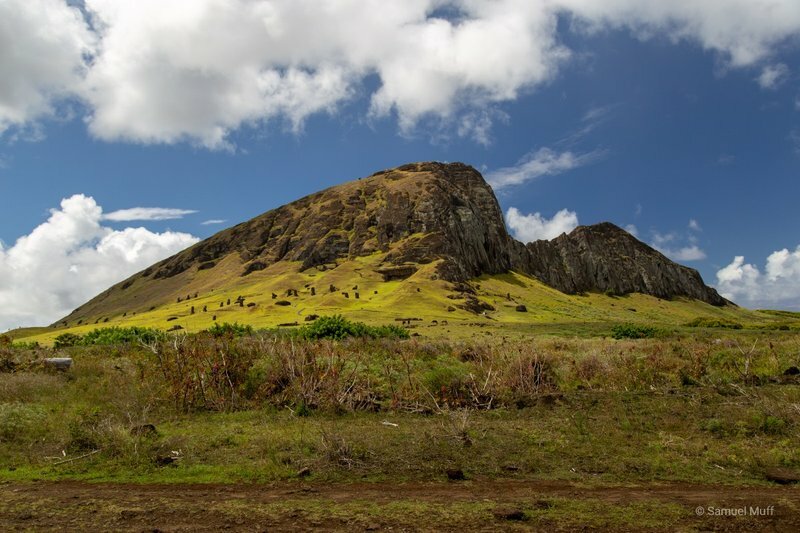 The most stunning place on the island was Rano Raraku, the quarry where all Moai have been created before being transported to their final location. There were dozens of Moai in different states of construction standing or laying around on the slopes of this mountain. We were amazed by the amount of details that was still visible in the carvings of these statues. 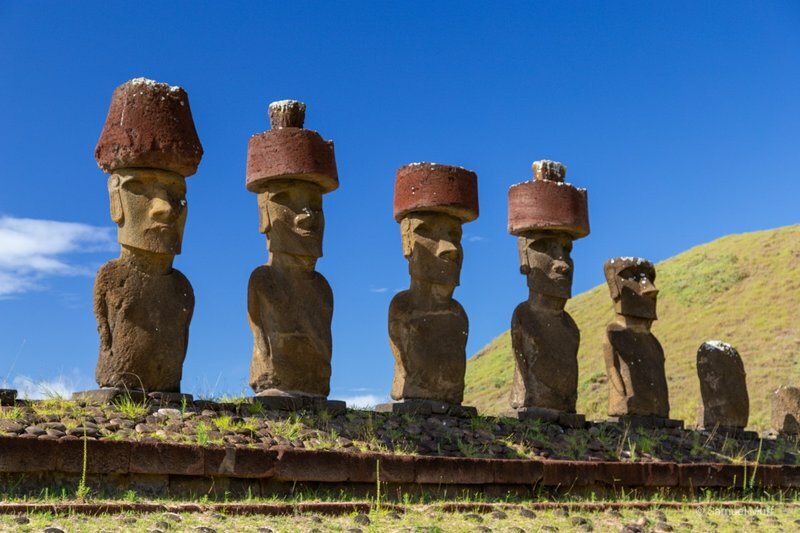 The only parts of the Moai that are not from here are the red hats that can be seen on some of their heads. These originate from another quarry far away, which we also visited. 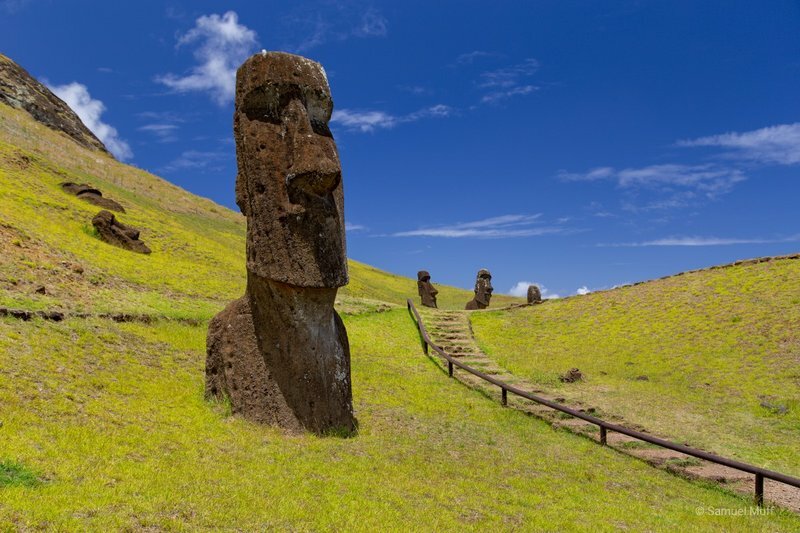 Besides the Moai, the island is not particularly beautiful. 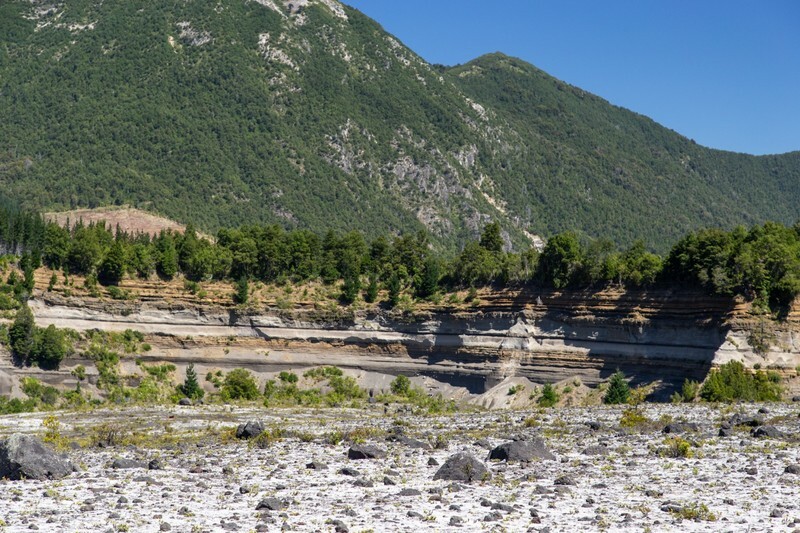 We did a few hikes, but the landscape is for the most part very barren, a stark contrast to the dense vegetation we saw on all other Polynesian islands we visited. 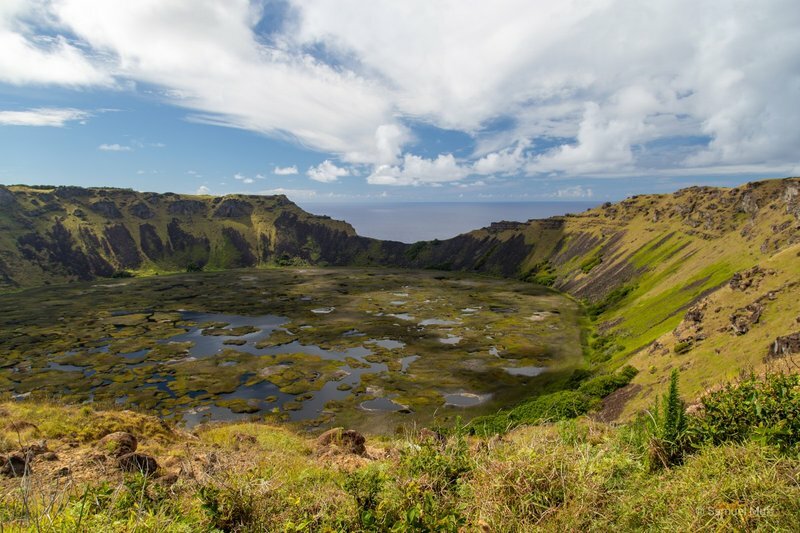 Legend has it that the Rapa Nui were once a prosperous civilization, but they used their resources in an unsustainable way, cutting the trees faster than they could grow back and overhunting the diverse fauna. This is said to have led to the fall of their civilization and to the state of the island as it is now. The few trees that can be seen today have all been planted in the last 50 years. Overall, our 5 days on Easter Island were a good farewell to Polynesian culture and a great welcome to Chile. 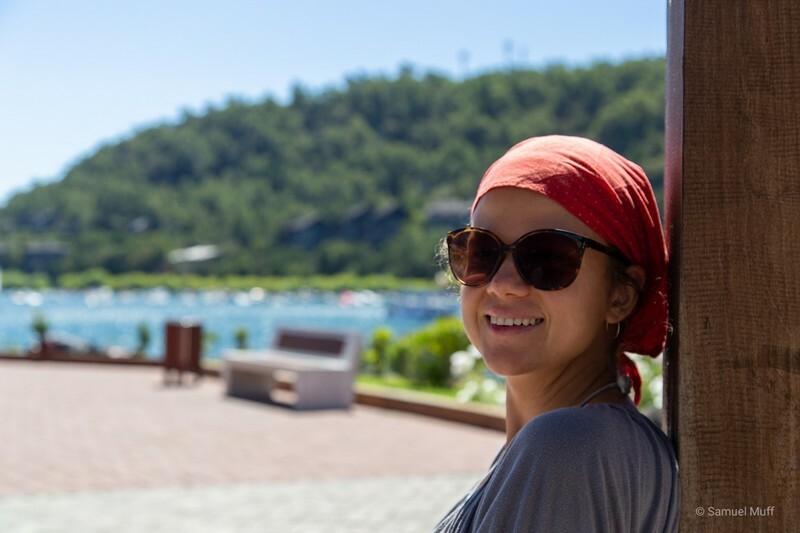 It was one of these unique places where two cultures mix and coexist peacefully and Hola! can be heard as often as Iorana!